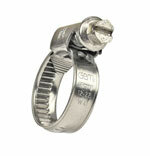 Hose clips made of stainless steel, for fuel hoses from diameter 7mm up to 11mm. The wide of the clip is 5mm. Clip made of stainless steel for fuel hosed from diameter 8mm up to 12mm. The wide of the clip is 7,5mm. for fuel hose from D= 12mm up to 20mm. the wide of the clip is 9mm. Please note: in application with polyamid pipes you have to insert an metal bushing in advance! Flexible fuel hose with inside texture and rubber surface. Delivery as single part without mounting bits. The price is for each 1m lenght. If you order for example 3x 1m so you will get one piece with 3m length and so on.